I am very much interested in Southeast Asian and Pacific archaeology, although my concentration for the past few years has been on Island Southeast Asia and the Philippines. I am interested in further advancing archaeobotanical studies in the region with the objective of elucidating human-plant and human-landscape relationships in the past. I keep an active field work profile with an active multidiciplinal approach in addressing research questions. Studying transforming cultural consciousness and cosmologies and their materiality in Southeast Asian and Oceanic cultures is a standing interest of mine. Ph.D. Archaeology, University of Cambridge, U.K.
Mphil Archaeology, University of Cambridge, U.K.
Lara, M., H. Lewis, V. Paz, W. Ronquillo. Implication of pathological changes in cremated human remains from Palawan, Philippines, for island Southeast Asian archaeology.The Routledge Handbook of Bioarchaeology in Southeast Asia and the Pacific Islands. M. Oxenham and H. Buckley. London, Routledge. “A String of Lingling-o Around a Middle-Sea”. In Tie a String Around the World, The Philippine Pavillion Biennale Arte 2015. Edited by Patrick D. Flores, pp. 47-65. Manila: National Commission for Culture and the Arts. "Foraging," in Archaeology of Food, An Encyclopedia, vol. 1. Edited by K. B. Metheny and M. C. Beaudry, pp. 226-227. Lanham, Maryland: Rowan & Littlefield. "Niah Caves," in Archaeology of Food, An Encyclopedia, vol. 2. Edited by K. B. Metheny and M. C. Beaudry, pp. 340-342. Lanham, Maryland: Rowan & Littlefield. "Glocal Themes in the Archaeology of Palawan, in Palawan and its Global Connections. Edited by J. F. Eder and O. Evangelista, pp. 36-67. Quezon city: Ateneo de Manila University Press. "The Philippines," in The Cambridge World Prehistory, vol. 1. Edited by C. Renfrew and P. Bahn, pp. 521-533. Cambridge: Cambridge University Press. "Archaeology and Anthropocene Discourses. Journal of Contemporary Archaeology, 1(1): 110-113. Janine Ochoa, V. Paz, H.Lewis, J. Carlos, E. Robles, N. Amano, M. R. Ferreras, M. Lara, B. Vallejo, Jr., G.Velarde, S.A.Villaluz, W.Ronquillo, W. Solheim II. The archaeology and palaeobiological record of Pasimbahan-Magsanib Site, northern Palawan, Philippines.Philippine Science Letters, 7(1):22-35. Co-author to chapters 4, 5,6 & 7. in Graeme Barker (ed). Rainforest foraging and farming in Island Southeast Asia. The Archaeology of the Niah Caves, Sarawak (Vol. 1). Cambridge:McDonald Institute for Archaeological Research. Lara, M., V. Paz, H. Lewis, W. Solheim. "Bone Modifications in an Early Holocene Cremation Burial from Palawan, Philippines." International Journal of Osteoarchaeology DOI: 10.1002/oa.2326. "Rethinking the Philippine Neolithic," in Philippines, an Archipelago of Exchange. Edited by C. de Monbrison and C. S. Alvina, pp. 50-57. Paris: Actes Sud, Musée du quai Branly. "Archaeology and Southeast Asia " in The Oxford Companion to Archaeology, vol. 2. Edited by N. A. Silberman, pp. 505-507. Oxford: Oxford University Press. "Accessing Past Cosmologies through Material Culture and the Landscape in the Philippines" in Archaeology of Spiritualities, p. 133-162. Edited by K. Rountree, C. Morris and A. A. D. Peatfield. with Graeme Barker, Lindsay Lloyd-Smith, Huw Barton, Franca Cole, Chirs Hunt, Phil Piper, Ryan Rabett, & Katherine Szabo. "Foraging-farming transitions at the Niah Caves, Sarawak, Borneo." Antiquity 85 (2011): 1-18. Philip Piper, Janine Ochoa, Emil Robles, Helen Lewis and Victor Paz. "Palaeozoology of Palawan Island, Philippines." Quaternary International 233(2):142-158.
with Christopher M. Wurster, Michael I. Bird, Ian D. Bull, Frances Creed, Charlotte Bryant, Jennifer A.J. Dungait. Forest contraction in north equatorial Southeast Asia during the Last Glacial Period. Proceedings of the National Academy of Sciences of the United States of America. 107(35):15508-15511. Comments on Donohue & Denham: Farming and Language in Island Southeast Asia, Reframing Austronesian History. Current Anthropology 51:223-256. Neri, L.M., V.J. Paz, A.P. Roa, A.M. Ragragio, and A. J. Carlos. Archaeological Survey of the Island of Camiguin, Northern Mindanao. Philippine Quarterly of Culture & Society. University of the San Carlos Press. Vol. 38, No. 3. pp. 231-257. A Periodization for a History of Archaeology in the Philippines. Proceedings of the Society of Philippine Archaeologists. Vol 7, 1-16. Defining Manila Through Archaeology. In Bernadita Reyes Churchill (Ed.). Manila: Selected Papers of the 17th Annual Manila Studies Conference, August 13-14, 2008. Manila: Manila Studies Association, Inc. and NCCA, 1-35. Leee Neri, Aya Ragragio, Jane Carlos, Emil Robles,V. Paz. The Archaeology of the Coastal Area of Northern Mindanao, Philippines. Proceedings of the Society of Philippine Archaeologists. 6:78-86. Paz, V. and T. Vitales. Sinaunang Anting? Isang pagtingin sa mga artefak ng Burial 727 sa Ille. Test Pit. 13:30-34.
with Helen Lewis, Myra Lara, Huw Barton, Philip Piper, Janine Ochoa, Timothy Vitales, Jane Carlos, Tom Higham, Leee Neri, Vito Hernandez, Janelle Stevenson, Emil Robles, Andrea Ragrario, Rojo Padilla, Wilhelm Solheim and Wilfredo Ronquillo. Terminal Pleistocene to mid-Holocene occupation and an early cremation burial at Ille cave, Philippines. Antiquity 82 (316): 318-335.
with Philip Piper, Janine Ochoa, Helen Lewis, Wilfredo Ronquillo. The first evidence for the past presence of the tiger Panthera tigris (L.) on the island of Palawan, Philippines: Extinction in an island population. Palaeogeography, Palaeoclimatology, Palaeoecology 264:123-127.
with Huw Barton. Subterranean Diets in the Tropical Rain Forests of Sarawak, Malaysia. In Denahm, Tim, Jose Iriarte and Luc Vrydaghs (Eds.). Rethinking Agriculture: Archaeological and Ethnoarchaeological Perspectives. California:Left Coast Press, pp. 50-77.
with J-C Gaillard, FG Delfin, Jr., EZ Dizon, EG Ramos, CT Remotigue, KS Rodolfo, FP Siringan, JL A Soria, and JV Umbal. Planning for the Future: A Multidisciplinary Approach to Reconstructing the Buag Episode of the Mt. Pinatubo, Philippines. In Grattan, John & Robin Torrence (Eds.). Living Under the Shadow: The Cultural Impacts of Volcanic Eruptions. One World Archaeology Series, Volume 5, California: Left Coast Press, pp. 225-252.
with Michael I. Bird, Ella M. Boobyer, Charlotte Bryant, Helen A. Lewis and W. Edryd Stephens. A long record of environmental change from bat guano deposits in Makangit Cave, Palawan, Philippines. Earth and Environmental Science: Transactions of the Royal Society of Edinburgh, 98:59-69, Cambridge University Press. Public Archaeology in Mindoro and the Improvement of a Philippine National/Cultural Consciousness. Proceedings of the International Seminar on Archaeology and Nation Building: in conjunction with the 10th anniversary of the establishment of the Centre for Archaeological Research Malaysia. Penang: Pusat Penyelindikan Arkeologi Malaysia, pp. 52-65.
with Graeme Barker, Huw Barton, Michael Bird, Patrick Daly, Ipoi Datan, Alan Dykes, Lucy Farr, David Gilbertson, Barbara Harrisson, Chris Hunt, Tom Higham, Lisa Kealhofer, John Krigbaum, Helen Lewis, Sue McLaren, Alistair Pike, Phil Piper, Brian Pyatt, Ryan Rabett, Tim Reynolds, Jim Rose, Garry Rushworth, Mark Stephens, Chris Stringer, Jill Thompson and Chris Turney. The 'human revolution' in lowland tropical Southeast Asia: the antiquity and behavior of anatomically modern humans at Niah Cave (Sarawak, Borneo). Journal of Human Evolution 52(3): 243-261. The Philippine Islands and the Discourse on the Austronesian Dispersal. in Simanjuntak, T, Pojoh I.E.H., M. Hisyam (Eds.). Austronesian Diaspora and the ethnogenesis of People in Indonesian archipelago. Jakarta: LIPI Press, pp. 279-298. Foreword to Archaeology and Culture in Southeast Asia: Unraveling the Nusantao by Wilhelm G. Solheim II. Quezon City: University of the Philippines Press, vii-xii. Uranium series direct dating of mineralized human bones from Ille site. Test Pit 8: 26-27. Leee Anthony M. Neri, Victor Paz, Jun G. Cayron, Emil Charles Robles, Andrea Malaya M. Ragragio, Michelle S. Eusebio, Vito Paolo C. Hernandez, Anna Jane B. Carlos. Archaeology at Cagayan de Oro City Hukay. 7:1-40.
with Jean-Christophe Gaillard, Francisco G. Delfin Jr., Eusebio Z, Dizon, John A. Larkin, Emmanuel G. Ramos, Cristina T. Remotigue, Kelvin S. Rodolfo, Fernando P. Siringan, Janneli Lea S. Soria, Jesse V. Umbal. Dimension anthropique de l' éruption du Mont Pinatubo, Philippines, entre 800 et 500 ans BP (Anthopogenic dimension of the eruption of Mount Pinatubo, Philippines, between 800 and 500 year BP. L'anthroplogie 109: 249-266. Arkiyoloji, Komunikasyon at Simbolismo. Test Pit, 5:23-27. Of nuts, seeds and tubers: The archaeobotanical evidence from Leang Burung 1. in Keates, S.G. & J.M. Pasveer (eds.). Quaternary Research in Indonesia. Modern Quaternary Research in Southeast Asia 18: 191-220. Addressing the redefinition of the Palaeolithic and the Neolithic in the Philippines. Proceedings of the Society of Philippine Archaeologists 2:1-14.
with J-C Gaillard, F.G. Delfin, Jr., E.Z. 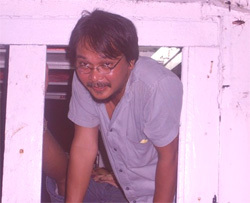 Dizon,E.G. Ramos, C.T. Remotigue, K.S. Rodolfo, F.P. Siringan, J.L.A. Soria, J.V. Umbal. Socio-economic impact of the c. 800-500 yr BP eruption of Mt. Pinatubo (Philippines) Hypotheses from the archaeological and geographical records. Proceedings of the Society of Philippine Archaeologists 2:46-58. Editor. Southeast Asian Archaeology: Wilhelm G. Solheim II Festschrift. Quezon City: University of the Philippines Press. Crop Domestication in Southeast Asia. In Goddman, Robert (ed.) Encyclopedia of Plant and Crop Science. Marcel Dekker Inc.: New York, pp. 320-322.